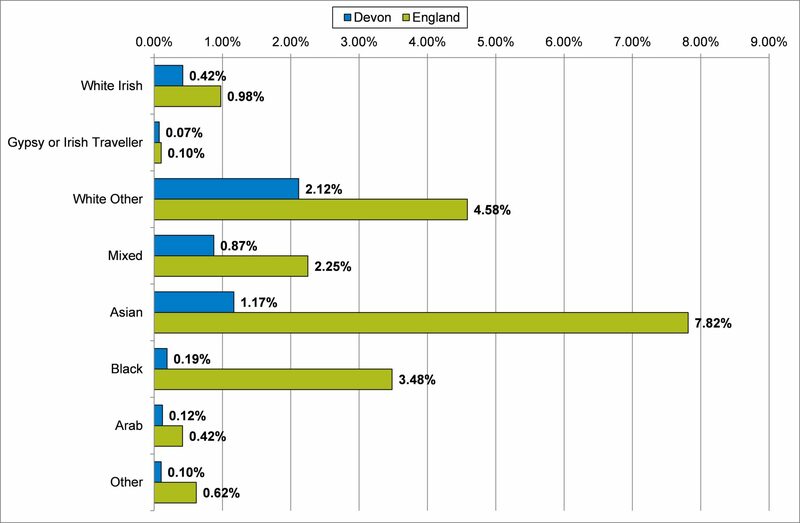 Although the proportion of people from an ethnic group in Devon is low compared to other parts of England (Figure 5.12), health behaviours and health outcomes are often very different from those from a white British ethnic background. 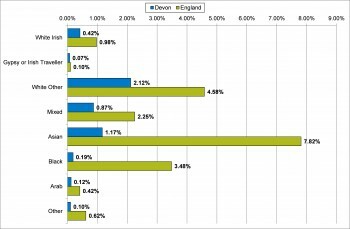 Figure 5.12: Percentage of population in ethnic groups other than White British, Devon and England, 2011. Perinatal mortality and infant mortality rates are generally higher among groups from the Indian sub-continent and the Caribbean, All-cause mortality is markedly higher for men and women born in West/South Africa, East Africa, Scotland and Ireland. Coronary heart disease and lung cancer are the major causes of death, regardless of ethnic group. Ischaemic heart disease is particularly high for men and women born in the Indian subcontinent, and for men born in East Africa, but lower in people born in the Caribbean and West/South Africa. Stroke mortality is elevated for all the ethnic groups[http://better-health.org.uk/briefings/tackling-health-inequalities-minority-ethnic-groups-challenges-and-opportunities]. Smoking and use of chewing tobacco and obesity (with higher levels of diabetes) are more prevalent in Bangladeshi people. Irish and Black Caribbean women are much more likely to have high blood pressure than women in the general population. Conversely, large-scale surveys like the Health Survey for England show that some ethnic groups such as Chinese people have a better self-reported health status as White British, whereas Indian, East African, Asian and Black African people report a similar level of health to White British. There may also be generational differences where people who were born and brought up in the England may have worse health than their parents who migrated here[http://better-health.org.uk/briefings/tackling-health-inequalities-minority-ethnic-groups-challenges-and-opportunities]. Poverty is a factor that may overlay ethnic differences in health, creating considerable inequality in health.